Radius Realty | Should I Restore an Old House or Build a New One? Should I Restore an Old House or Build a New One? Interested in buying a historic home? We’ll help you decide whether to restore it, or tear it down and rebuild. The proud history of St. Louis is reflected in its architecture. Every neighborhood seems lined with historic buildings, from elegant Greek Revival mansions to Modernist masterpieces. No matter where you go, you can’t walk through the city without feeling as though you’re journeying into the past. As appealing as the aesthetic of an older home may be, these properties can present some challenges to 21st-century owners. Most historic houses lack the modern conveniences of newer construction, and they may need extensive remodeling to meet the expectations of today’s homeowners. In some cases, would-be renovators must abide by strict historic building codes, making the prospect of buying an older home even more daunting. Can You Afford to Restore or Remodel? As with any home purchase, the first question you need to ask yourself is: “what can I afford?” Buyers of old homes will need to calculate the costs of restoration or renovation, add them to the final sale price, and determine whether the potential return on investment outweighs the initial expense. Restoring an old house can save you money — but only if things go according to plan. If you’re planning to live in your home long-term, it may make sense to tear down the old home and build a new one. After all, a 20-year-old house will be more appealing to most buyers than a 50-year-old house. Building a new home also gives you a clean slate, eliminating the chance of finding “surprises” — a broken pipe, mold in the attic, or a sinking foundation — that may cost you dearly later on. But if you’re on a budget or planning on selling in five years or fewer, restoration over time might be more appealing. Over time, you can make necessary repairs or upgrades that improve your quality of life and increase the property’s value. What Historical Limitations are in Place? Even if you can afford to upgrade a historic home, the city may not allow you to make certain changes. Many older homes are protected by local zoning laws and exempted from portions of the current building codes. Legal recognition of historical significance can add appeal and value to a home, but prospective buyers need to accept the limitations that come with that status. Seventeen neighborhoods in St. Louis are recognized as City Historic Districts and “ha[ve] a unique set of rehabilitation and design standards that were developed by neighborhood residents.” As a result, any proposed alterations to a building within these districts must be approved by the Cultural Resources Office or the Preservation Board. Any buyers searching for homes in these neighborhoods will need to abide by their rules when planning renovations. Will You Be Happy with Your Older Home? Lastly, you should ask yourself honestly if an older home will suit your lifestyle and aesthetic preferences. If you have or are planning to have children, can you childproof your historic home? Can you handle the compromises on space, light, and insulation that often come with older properties? Do you appreciate the older, often custom details that come with historic homes, or do you prefer a modern style? There’s nothing wrong with wanting a newer home, but if you choose renovation or restoration, make sure you’ll truly be happy with the final outcome. If you’re looking to restore an older home, it helps to work with a team of experienced professionals who understand your needs. 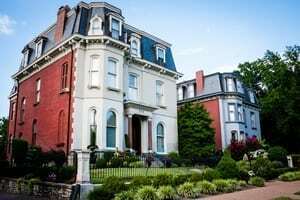 At Radius Realty, we’ve sold and renovated properties in protected neighborhoods across St. Louis, from Lafayette Square to McKinley Heights. We’d be happy to apply our expertise to your future home!